Finn Dwyer, aged fifteen, is growing up on a dairy farm in Ireland, her thoughts of horses and friendships. When she is challenged in the worst way, she doesn't know how to go forward in life. 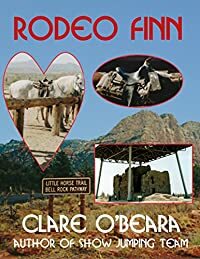 Summer on her uncle's ranch in Arizona with her cousin Sean and a beautiful black mare Juana gives Finn the chance to let go of her unhappiness. Not only does she explore the Sonora Desert, she learns trail riding, cattle roping and rodeo skills. When her strength and decisiveness are called upon however, will Finn prove herself? Another atmospheric story of young adults, horses and challenges from the author of Amazon No.1 Bestseller SHOW JUMPING TEAM and MURDER AGAINST THE CLOCK. Clare O'Beara won the Arkady Renko short story competition held by Simon & Schuster in 2014 and judged by Martin Cruz Smith. "Please congratulate Clare O'Beara for me for her clever short, short story 'London Calling.' I appreciate that she treated Arkady kindly, taking his age into consideration, and managed to cross the finish line with a different sort of twist."